Apple's worldwide online store went down today, which could only mean one thing – new fruit-based products. While the tech world waited with bated breath for word of official iPad pricing in the UK, what actually appeared were some brand-new MacBook Pros. There are three sizes in the range 13, 15 and 17 inch and six new models overall. Even at the smallest screen size the new MacBook Pro range packs a massive memory punch – as standard, all the laptops come with 4GB memory. The 13-inch models come with Intel Core 2 Duo processers, either 2.4GHz or 2.66GHz. Hard drive space is palatial, with the option of 250GB or 320GB storage. And there's also a Nvidia GeForce 320M graphics card on board. The 15-inch range comes in three flavours: a Core i5 2.4Ghz, Core i5 2.53GHz and Core i7 2.66GHz. These are all about power, with 4GB memory as standard (this is upgradeable to 8GB). Hard drive wise, you are looking at 320GB minimum, which can be pushed to 500GB. The 15-inch models also house a NVIDIA GeForce GT 330M with either 256MB or 512MB dedicated memory – which will save on battery life. In fact battery life is a strong point for the whole range, with Apple boasting around 10 hours on a single charge. 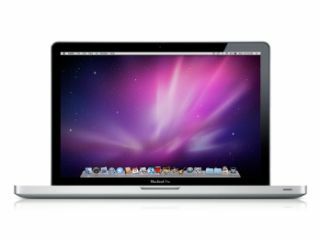 The final model is the 17-inch 2.53GHz MacBook Pro range. This uses the Core i5 chip, comes with 500GB hard drive and 4GB memory, which is expandable. In fact, there are a number of features you can add to all the MacBook Pro range, including the introduction of Solid State Drives, from 128GB all the way up to 512GB. Processors can also be 'turbo charged' if you so wish. As with all Apple products, quality comes at a price. The MacBook Pro range is no different. The 13-inch 2.4GHz starts at £999, while the 17-inch model is £1,899. Add some extras on and you may need to call the bank manager. All the MacBook Pros have a UK release date of now.